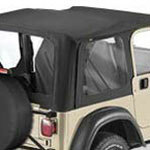 Jeep soft tops have really improved in quality and functionality over the years. You can now choose from options like tinted windows, heavier/quieter sailcloth material, and sunrider tops. So, if your Jeep only came with a hard top (or your old soft top has seen better days) check out some of the newer models.